At Suburban Landscaping we know that your dream landscape is possible to build, but most clients are unsure what the costs would be to build it. To assist our customers in preparing a budget for their landscaping, we have provided some general price guidelines for our different services. Please remember that these prices are examples. 16 'x 20' Paveloc Holland paver patio in your choice of colors, with curved sides, either running bond or basket weave patterns, using a matching decorative soldier course. Installed on a limestone gravel base. Brick Patio Example #3 20' x 25' Unilock Brussels paver patio in your choice of colors, with curved sides, in a non-pattern design, using a matching decorative soldier course. Installed on a limestone gravel base. Brick Notes: Patio prices are less per square foot for larger patios because of reduced setup and material delivery. Removal of existing items in the patio are will increase the costs. Sidewalk and patio prices are less when combined together. Wall Notes: There are many, many different wall stones and brick available. See the Examples Of Our Work page or visit the Retaining Wall page for more ideas and examples. Walls can also be constructed from Natural Stone if desired. Install 6cm Paveloc Holland Stone bed edging,in your choice of colors, with gravel base and weed barrier fabric. Laid in two rows flat. Per foot, 50' minimum. Less per foot for larger quantities. Bullet Edgers Example #3 Install Paveloc concrete Bullet Edgers as bed edging in a new bed. Edgers are set on a compacted gravel base and a weed barrier fabric. $600 Minimum. Your choice of colors. Approximatley $12 Per Linear foot. Edging Notes: Price per section may vary due to partial lengths installed or other factors like tree roots and location of edging. Installing a 6-strain Improved Kentucky Bluegrass premium sod in a flat back yard, 50' x 50', with fresh top soil added, and old turf removed and disposed. Installing a 6-strain Improved Kentucky Bluegrass premium sunny seed in a front or back yard, 50' x 50', with fresh top soil added, and old turf removed and disposed. Sod & Seed Notes: There are many seed types available with many different germination rates. We only use the highest quality seeds at recommended rates. Hill sides will require staking for sod, or matting for seed, both are extra. Hand weeding of the beds by crew trained in the difference between weeds and plants. Scheduled as an on-call service, or once per month service May-October. Weeds are removed by the roots. Leaf Clean-Ups Spring or Fall. Blowing debris out of all planting beds, removal of all annuals, and perennial tops, and 2" final mowing of the lawn to prevent matting of the turf. All debris removed and properly disposed. $120 Minimum. Gutter Cleaning Screens on the gutters are extra, washing the gutters is extra, and taller roof lines raise the price. Installation of new lawn irrigation system. Meet with an maintenance estimator or landscape designer today and know exactly what your project would cost. 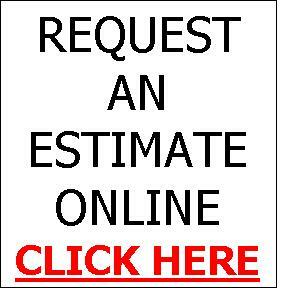 Estimates are free, in writing, detailed and complete. Estimates can also be broken into stages to fit your budget or time frame. Suburban Landscaping also offers several financing methods as well.